Thai Nguyen is beautiful and slow pace midland province; it located closely to Hanoi capital city. In Vietnam whenever talking about Thai Nguyen, people cannot helping imagine about typical local special production of green tea, it accessible long national road No.3 within 60km northern of Hanoi sharing border with neighborhood province such as Hanoi capital on the south, Bac Can on the north; Vinh Phuc, Tuyen Quang on the west, Lang Son, Bac Giang on the east. With very convenience location, Thai Nguyen province became the gateway for economic and political exchanges between the mountainous region and northern midland region. Thai Nguyen has many mountain ranges running from south to north. The structure of them is made of strongly decayed rocks with many caves and valleys. In the southwest is the Tam Dao mountain range, located on the northern fringe of the Red River Delta. The range spans some 80 kilometers, with its highest peak of 1,529 metres and many cliffs running from northwest to southeast. 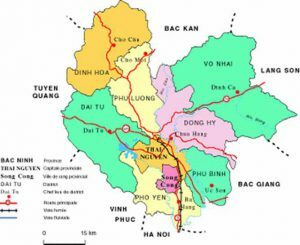 There are two other mountain ranges in the province, both running in a northwest-southeast direction; the Ngan Son range running from Bac Kan to Vo Nhai district and the Bac Son range. Many of the mountains of Thai Nguyen Province provide shelter for a considerable part from monsoon winds. With terrain sloping from high mountains to the low zones and midlands, in terms temperature in winter, Thai Nguyen has three climatic sub-zones. 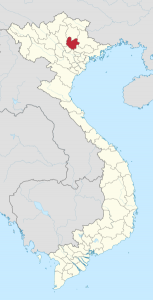 A cold sub-zone in Vo Nhai district, a temperate subzone including Dinh Hoa, Phu Luong and southern Vo Nhai districts and a warm subzone which includes Dai Tu, Dong Hy, Phu Binh, Pho Yen districts, Thai Nguyen City and Song Cong town. The average temperatures in the hottest and the coldest months are 28.9°C in June and 15.2°C in January. The lowest recorded is 13.7°C. Total number of sunny hours in a year is ranges between 1,300 and 1,750, which is equally distributed for months in a year. The climate of Thai Nguyen has two distinct seasons: the rainy season from May to October and dry season from October to May. Thai Nguyen has revolutionary tradition, historical vestiges including Van, Vo mountains, Dinh Hoa ATK vestige, and Duom Temple. Coming to there, tourists are attracted to visit Nui Coc Reservoir. This 2,500ha lake includes 89 islands, concealing mysterious legends. Nearby the lake, Coc Mountain stands imposingly amid the blue sky, the bright sunshine over every blade of grass and twig, all creating marvelous and splendid scenery. Phuong Hoang Cave and Mo Ga Stream attract many visitors to Thai Nguyen every year. The cave consists of three layers: Doi (Bat), Sang (Light) and Toi (Dark). Reaching the mouth of cave, visitors can see the landscapes of this land. Thai Nguyen City is on National Highway No.3 (Hanoi- Cao Bang), 80km from Hanoi. There is daily train from Hanoi to Quan Trieu, about 8km from center of Thai Nguyen City.